When oil prices were peaking in 2014, it affected multinational corporations around the globe. Berkshire Hathaway’s subsidiary, Precision Castparts Corp., itself had a subsidiary focused on oil and gas: PCC Energy Group. Precision Castparts Corp began bulking up its energy play, PCC Energy Group, by merging existing companies with newly acquired organizations. By 2014 PCC Energy Group was a global conglomerate operating in more than a dozen countries. It manufactured everything from OCTG to complex metal components, high-quality investment castings, forgings, and fastener systems for upstream, downstream, offshore, petrochemical, power generation, and other mission-critical applications. Large and small firms, formerly independent, were now operating inside a new structure and managers were looking for synergy. Companies like Hackney Ladish had been around for more than 100 years and were known as the leading global producer of forged pipe fittings for critical energy infrastructure. Another company, Special Metals, has a legacy dating back to 1835 and the pioneering of the original nickel alloys. Special Metals can boast that it’s invented over 80 percent of nickel and cobalt alloys including INCONEL®, INCOLOY®, NIMONIC®, MONEL®, and UDIMET®. Oh, did I mention the deadline? For reasons beyond my control, delays occurred in kicking off this project. However, the end delivery date remained firmly fixed. The upshot is that a great deal of work needed to happen in the compressed timeline of a matter of weeks. Tasked with content strategy, information architecture and copywriting, I immediately immersed myself into to all things PCC Energy Group. Not just the granular details of the vast array of product and services across the various companies, but how to make the story of this whole new conglomerate greater than the sum of it’s acquired parts. The content strategy pulled together product details from each entity to create a coherent narrative for PCC Energy Group as a whole. 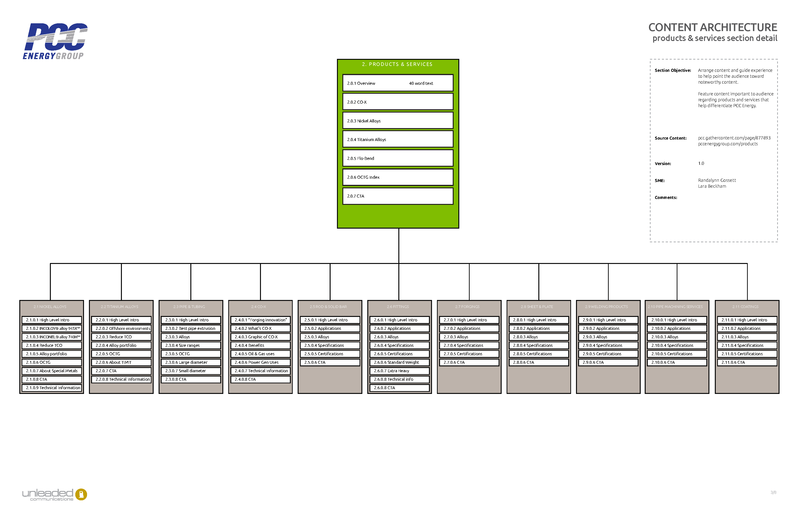 Top level Information Architecture with the primary content. The Products and Services section incorporates the vast amount oil & gas offerings. The Companies section shows the breadth and depth of PCC Energy’s capabilities. 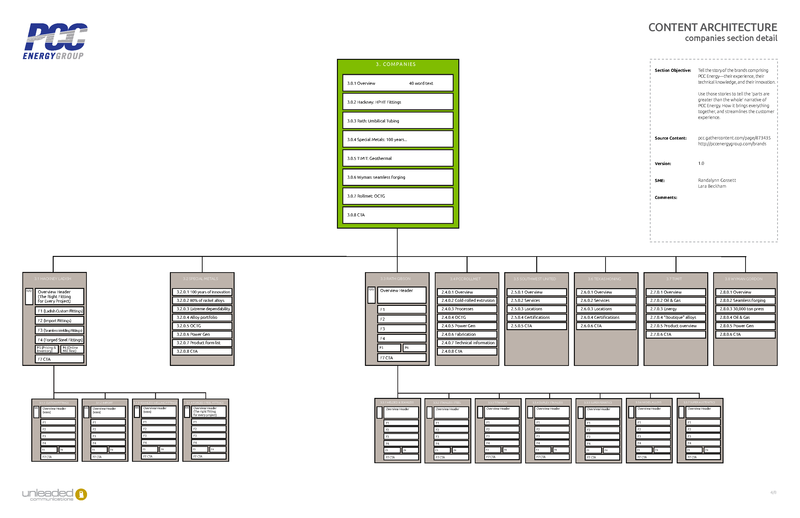 View the PCC Energy Group Information Architecture PDF. 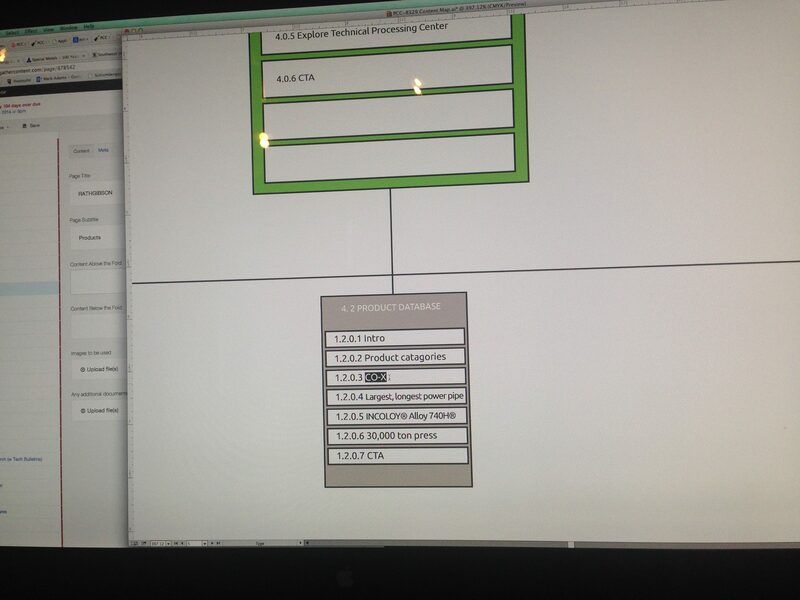 Identifying the content elements and creating the IA document for the Tech Center section. 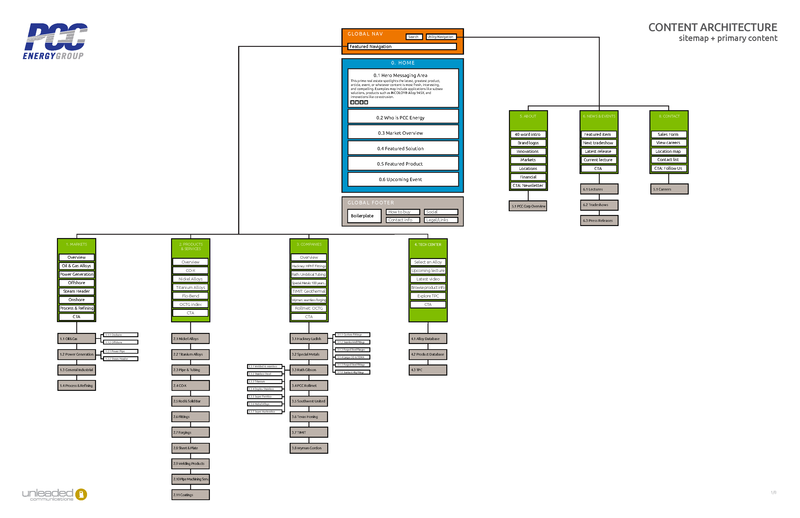 After walking the client through the Information Architecture, I proceeded to define the required master pages that needed to become templates for the site. 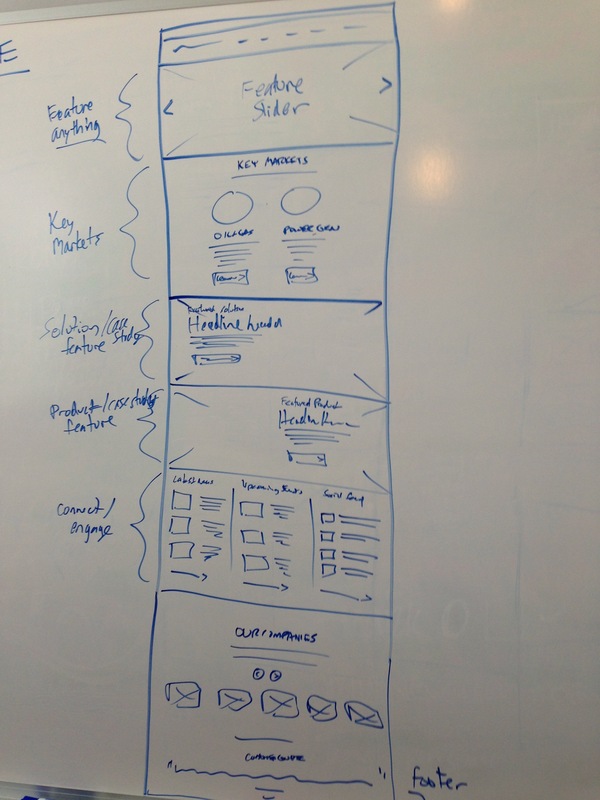 Then collaborated with a UX designer to create wireframes that were used to create UI designs. Based on the Content Strategy defined by the Information Architecture, this Wireframe was rapidly developed for the homepage. 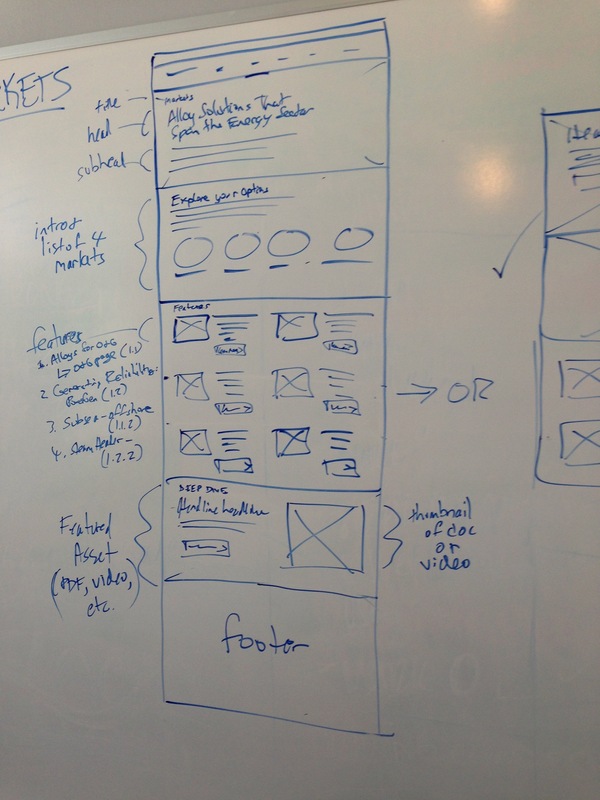 The Markets page rapidly wireframed on one of the creative professional’s favorite platforms—the good old-fashioned whiteboard. With the IA established, wireframing done and UI design underway, I started the process of fleshing out the copywriting. 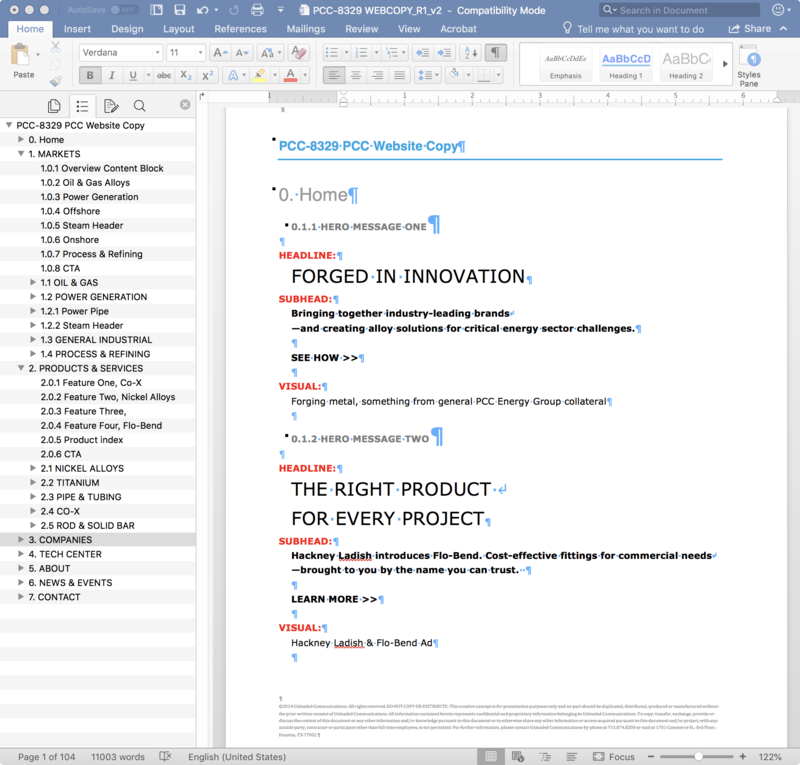 The 104 page Microsoft Word copy document was carefully formatted with style settings to allow easy navigation the for the review and development team. The numbering system used in the IA document is applied in the copy document, so it’s easy to match content to the design and it’s simple for the development team to add the content via CMS. After weekends and late nights, we made the deadline and delivered not just the PCC Energy Group site, but an entirely separate site for PCC Energy Group’s subsidiary Special Metals. The strategic creative process described here was also followed for the Special Metals site. There have been a few changes since 2014, but the structure and content of both sites remain mostly as I designed.